Peanut Butter Jelly TIME!!! I bought this a few yeas ago from Pampered Chef and just love it! 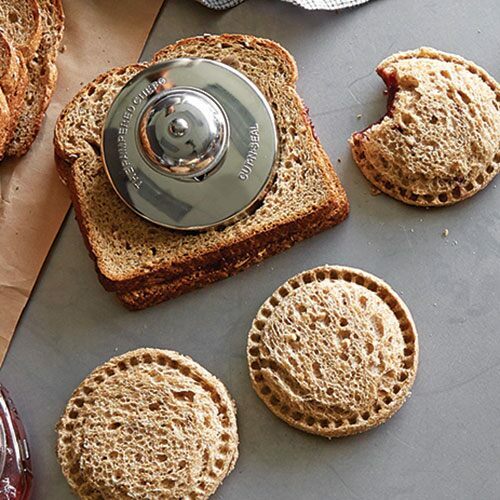 It makes perfect pb & j sandwiches. It cuts them in a perfect circle and seals the edges. My kids loved those pre-made pb&j frozen ones you can buy. But, they were so expensive for only a few of them. This is wonderful because you can make as many as you want at once and freeze them as well for lunch, snacks etc. They are very easy to use and when kiddos can use them! People also use these sandwich presses to also make mini pies. I know you can probably find these cheaper on Amazon and EBay. That's really cool. I didn't know such a thing existed .. also, I've heard really good things about Pampered Chef. This is cool. It looks like you could make your own hot pockets with it too. Wow! What will they think of next?! @cassandra_garza yes you could! Or small fruit pies!